NEW YORK - NOVEMBER 2008: The American Friends of Jamaica's 27th Annual Gala and Auction at Gotham on Thursday, November 6, 2008 in New York City. November 6th, 2008. New York City. Lennox Lewis, three time winner of the Heavyweight Boxing Championship Title of the World took off his gloves and opened his heart for Jamaica last night. The 6 ft 5 in boxing champion took an Olympic Gold Medal in 1988, last night he took a humanitarian award for his services. Lennox was honored by The American Friends of Jamaica (AFJ) with an International Achievement Award for his involvement in a wide range of philanthropic organizations in Academia and Sports. Born in England, to Jamaican born parents, Lennox has made significant contributions and raised important funds for charities in Jamaica. His wife, Violet (former Miss Jamaica runner-up), accompanied him. Some of the past honoree's of the prestigious AFJ award were Edgar and Louise Cullman, Chris Blackwell (Island Records), Ralph Lauren, and President Ronald Reagan. Last nights event was held at Gotham Hall and was chaired by Manuela Goren. Manuela and her husband James fell in love with Jamaica many years ago and have spent a significant amount of time and effort enjoying and helping the country. The event brought together many people wanting to express their love and support for Jamaica. I spoke with winter residents from Tryall, Round Hill and Rose Hall. Someone described Tryall as a blend of Nantucket and Palm Beach. Guests included corporate leaders, philanthropists, diplomats, and people from many different areas of life, some with Jamaican roots, some with no former ties to the country. There was a lot of warmth amongst the guests in attendance, maybe it was their love of the country shining through. I felt genuine Jamaican hospitality at its finest and that set the tone for the evening. Most people that I spoke to said, "You must come to Jamaica." The Honorable Olivia (Babsy) Grange. Minister of Information Culture, Youth and Sports made an enlightening speech informing us of many of Jamaica's contributions to the world. We all know that Jamaica has given us reggae music (thanks to Bob Marley and Chris Blackwell), but Jamaica has given us much more. Noble Prize winning scientist Paul Ehrlich, one of the main founders of chemotherapy, came from Jamaica, some other notables are Usain Bolt, the fastest man on the planet with a world record of 100 meters in 9.72 seconds, Asafa Powell is the world's second fastest man, Shelly-Ann Fraser from Kingston won the 100mt. at the Beijing Olympics however the record is still held by Florence Griffith-Joyner, and who could forget, the Jamaican Bobsled Team. No other Caribbean Island has a bobsled team in the winter Olympics. Babsy said, "We're little but we're awesome." There is a lot of truth to that statement. Latania Bingham from Montego Bay spoke gratefully about James and Manuela Goren and their support for her. She was accepted by an American University but could not afford to go. The Gorens invited her to America and gave her the most valuable tool, an education. She said that most of her friends in Jamaica dropped out of school, fell to drugs, teenage pregnancy and death. Latania plans to take the knowledge she learns in the US back to her country to help develop leadership skills in others. Lennox Lewis was actually in Toronto the night before and was inducted into The Canadian Hall of Fame. He credited his mother for all of his accomplishments and spoke of, "this momentous time in history" referring to President Elect Barack Obama's victory. He said he would like to regenerate boxing in Jamaica to encourage youth and teach goals, stating that if Jamaica has so many great athletes, they could also have the best boxers in the world. This drew a large round of applause from the audience. Being the father of two young children, Lennox acknowledged that he would like to give Jamaican youths more to do than "stand around." Lennox is a role model to youth and has devoted himself to helping improve their lives by showing them what they can be. He truly deserves this honor. In fact, Lennox was one of the last people to leave. He and his wife graciously stayed to talk with guests and allow numerous photo ops for his fans. The AFJ was established in 1982 to assist Jamaican charities in the areas of education, healthcare, human and economic development. 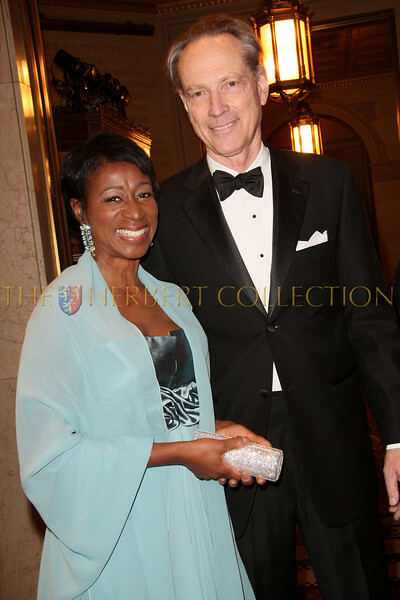 The next event will take place in Miami on May 16th, 2009 and will honor Jamaica Ritz Carlton's Michele Rollins. To learn more go to http://www.theafj.org.